Saint Martin is known most for cutting his cloak in half to share with a beggar during a snowstorm, to save the beggar from dying of the cold. In many countries, St. Martin’s Day or Martinmas celebrations begin at the eleventh minute of the eleventh hour of this eleventh day of the eleventh month. Bonfires are built, and children carry lanterns in the streets after dark, singing songs for which they are rewarded with candy. St. Martin’s Feast is considered the first day of Winter for practical purposes. This holiday also coincides with the end of harvest time, where it’s bounties are to be feasted upon. 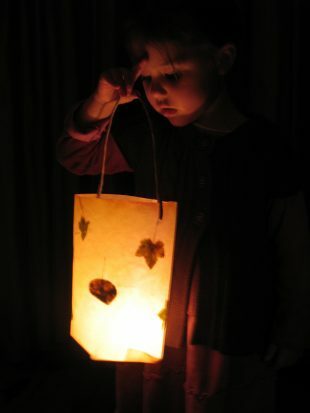 On this day, the children at my daughter’s school carried handmade lanterns through the cold dark, in celebration. The gossamer lanterns, made of hand-painted paper and candles, glow and bobble, works of art, soft and beautiful. The simplicity of a child lighting one’s own lantern and watching it glow. Carrying it through the dark early winter night. Sharing the light that we all carry. It is the simple beauty of this celebration that children take with them. They take it in and bury it in deep inside, where it will be safely hidden, until it is needed again to light their way and guide them on their journeys.